As more illegal immigrants are detained, some call it an immigration death sentence. A death sentence because they fear for their lives if they're deported back to their countries. Immigration is not just an issue at the borders, it is also an issue in Boston. One high profile case in Boston has become the example of the new changes in immigration enforcement. In the new immigration battle, 10-year-old Mellanie of Chelsea, Massachusetts is the new collateral damage. She tells NBC Boston Investigators about her father. Her father, Francisco Rodriguez, came to this country undocumented, fleeing El Salvador in 2006. He feared for his life, saying he was threatened by gangs. After 10 years in the U.S., Rodriguez was taken into custody during a routine check-in with ICE. 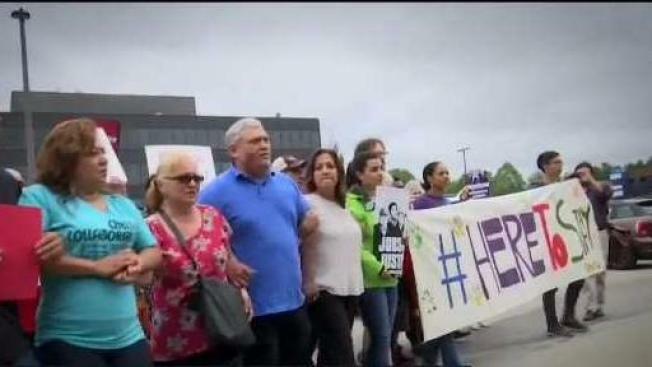 Although he showed up with the required plane ticket, ICE says he failed to make a deadline to go back to El Salvador. His immigration attorney Matt Cameron disputes that. An NBC investigation across the country found a backlog of immigration cases clogging an overloaded system. Massachusetts is among the nation's 10 states with the highest number of cases in immigration courts. In Boston, the court has over 20,000 pending cases, where the average wait for a hearing is three years. Rodriguez, with three children all born U.S. citizens and no criminal record, is now one of those new numbers. “It is a very great anguish, a pain too great,” Rodriquez's mother, Jessie, says. Jessie is in the car and very emotional on her way for a rare granted visit with her son at the Suffolk County Detention Center. “His greatest pain is for his children,” she says. According to TRAC, a group that monitors immigration, over 600,000 cases are backlogged in U.S. immigration courts. There are not enough courts or judges to keep up. In Massachusetts, over 1,300 undocumented immigrants have been deported. Nearly 2,400 granted a stay. One in three is typically deported. Jessie is concerned for her son to go back to El Salvador because he says gangs killed his employee and then threatened him. “There are people that ask for him. They could kill him. I don’t want my son to die,” Jessie said. Meanwhile, Mellanie keeps busy writing thank you notes to her father's supporters. “I love him a lot and I’m praying for him every single day," Mellanie said. Our NBC investigation with NBC owned and operated stations across the country found the backlog may be getting worse. Through a records request to the Department of Justice, it is confirmed DOJ is reassigning immigration judges to other parts of the country. At least four judges are being relocated from Boston, already delaying another 300 cases.